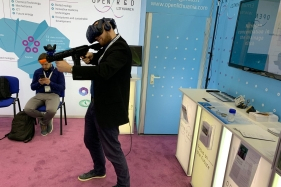 FTMC participated in the world's largest industrial exhibition "Hannover Messe 2019"
Center for Physical Sciences and Technology (FTMC) as a part of the Lithuanian Science Delegation, united by an open research and experimental development network Open R&D Lithuania, participated in the world's largest industrial exhibition "Hannover Messe 2019" (Germany) on 1-5 April 2019. The technology, inventions, and services provided at this exhibition were presented to business by six national science institutions at the joint stand of Lithuania, which was organized by the Open R&D Lithuania network, launched by the Agency for Science, Innovation and Technology (MITA). This year, FTMC presented innovative aluminum coatings and laser diodes at the "Hannover Messe 2019" exhibition. "Our coatings provide unique antibacterial and antifungal properties. It is also possible to dramatically increase wear resistance, which makes it possible to produce practically eternal mechanical parts. Laser diodes operating in the infrared field are a new Lithuanian breakthrough in laser technology, enabling laser systems to be reduced to the size of a matchbox", says Karolis Stašys, FTMC Innovation Manager. Another representative of FTMC Linas Eriksonas presented at the exhibition the achievements of Lithuanian laser technologies, possibilities of joint science-business projects with Lithuanian research institutions in the fields of photonics, chemistry and materials science, as well as participation in cluster initiatives.